Bring some winter fun indoors with a winter sensory bin for toddlers. When it’s too cold or snowy to play outside, indoor play with a variety of materials becomes even more important. 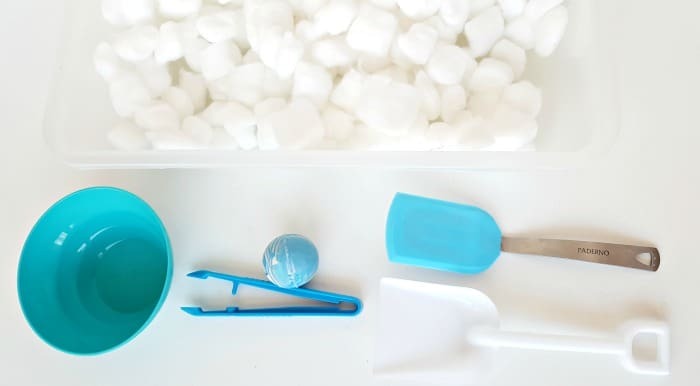 With some pretend snow, and a small shovel from your beach toys, you can easily provide some fun winter-themed sensory play for your toddler. 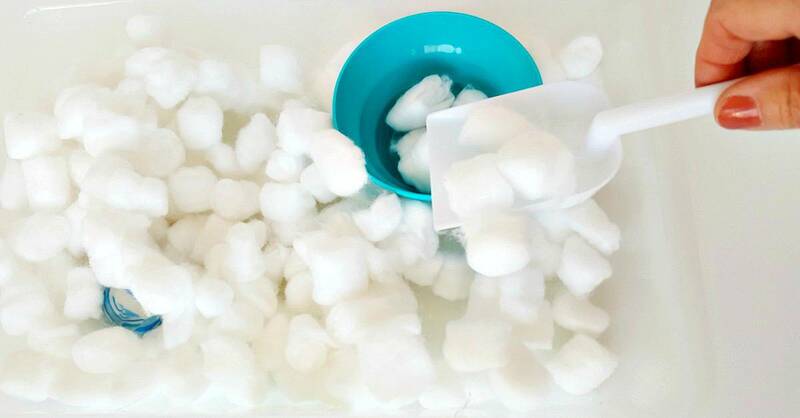 Sensory bins or tubs can be filled with a variety of kid-friendly materials, from pompoms to shredded paper. 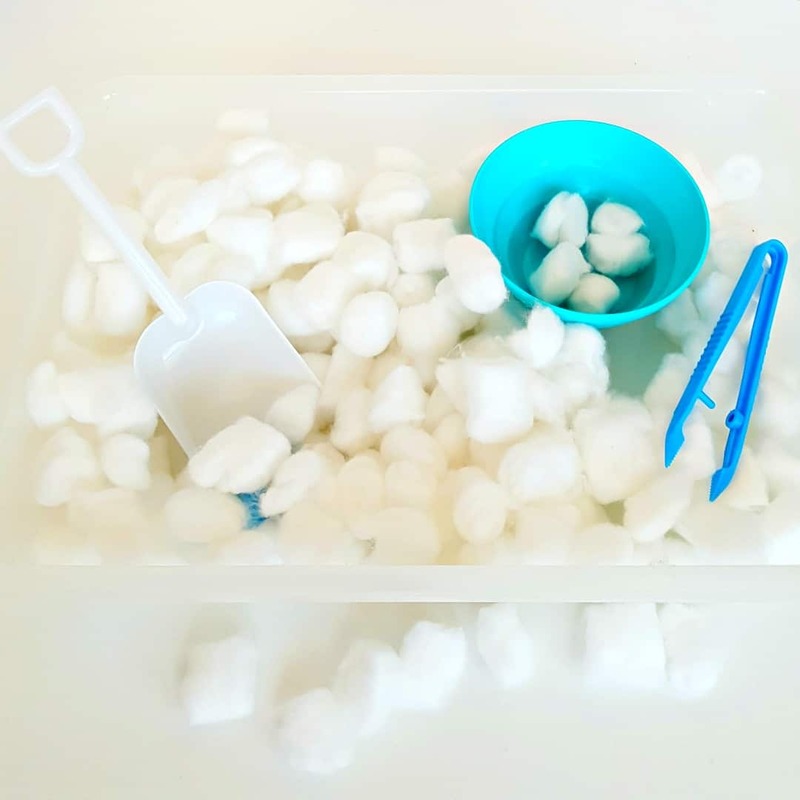 To make a winter sensory bin, look for materials that are white and fluffy, and offer unique sensory experiences with lots of opportunity to explore. 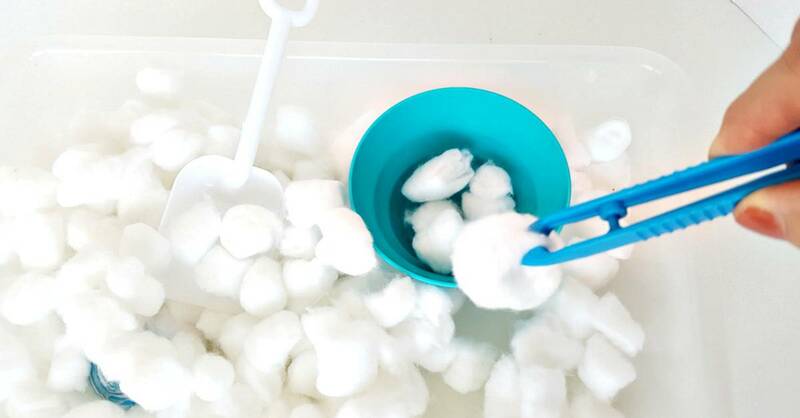 To make this winter-themed bin, empty a bag of white cosmetic cotton balls into a small plastic tub. Add small bowls and a few utensils such as tongs, a small shovel, and a spatula. You can provide white bowls and tools if you prefer to maintain a white color scheme, but a bit of color can prompt conversation around color recognition and comparison. 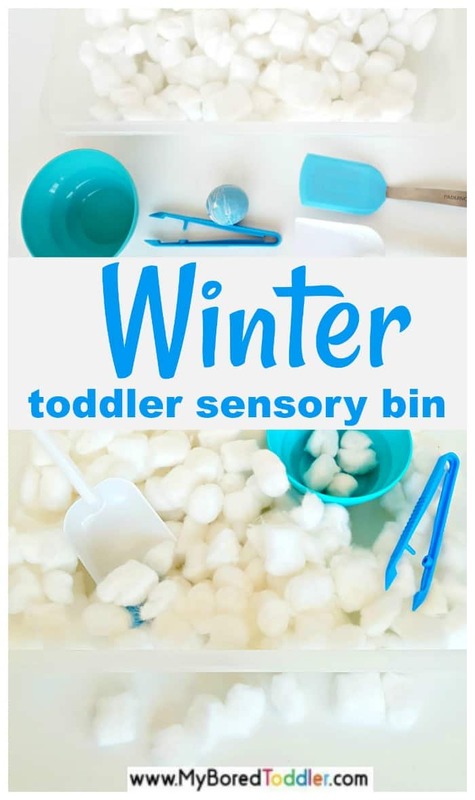 Your toddler can begin playing in the winter sensory tub right away: exercising fine motor skills as he scoops up the ‘snow’ with the different utensils; using cognitive and creative skills as she chooses tools to build mountains of ‘snow’ or fill a bowl. You picked up a big shovelful of snowballs. Do you think your bowl can hold more snow? Let’s count out 5 snowballs together. Try to stack cotton balls one on top of the other to make a snowman. How many cotton balls can you hold in one hand? In two hands? Can you walk across the room holding the shovel filled with cotton puffs? 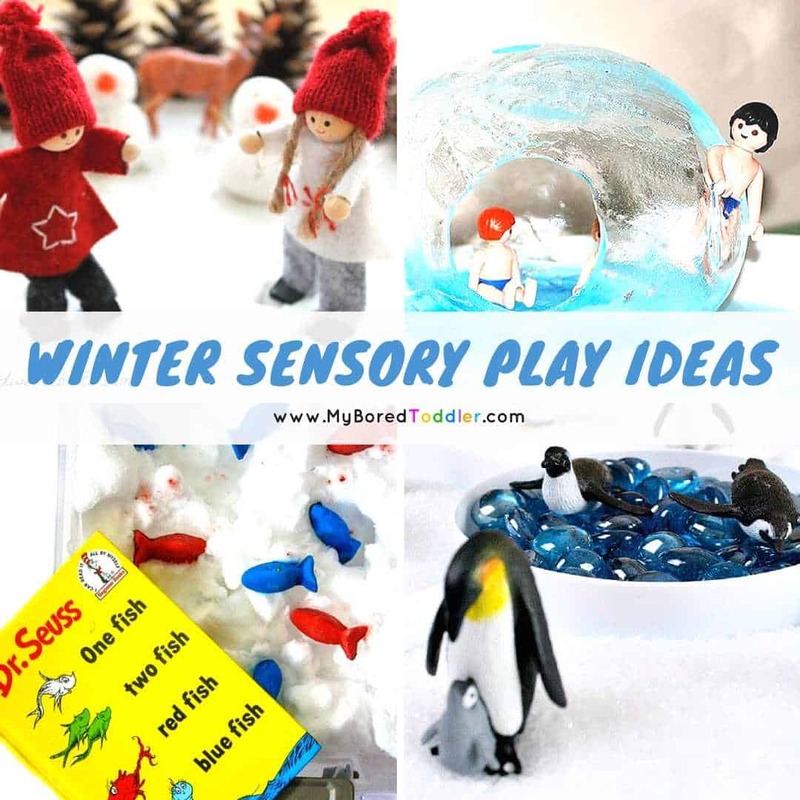 What else can you add to a winter sensory bin? A dump truck or snow plow? Some arctic animals? The benefits of this sensory bin are seen in the ease of set up and the amazing return in learning opportunities. Kids will love the play and you will love the play value! 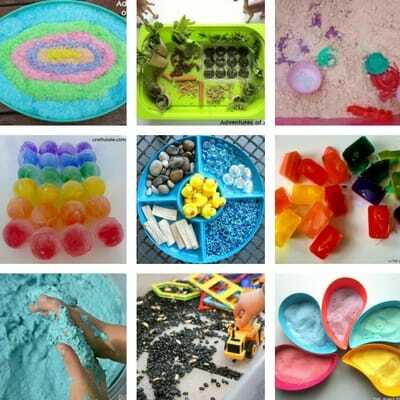 We would love to see pictures of your child playing with their winter sensory bin. You can share them in our Facebook group or on Instagram – use #MyBoredToddler so we can all see! You can also subscribe to our newsletter for weekly toddler activities.